Everyone buys something at Ikea at one point or another. Their stuff is cheap, looks good, 'relatively' durable, and can be hacked for the most part. The "Ekby Valter" bracket is one of those Ikea items that gets hacked a lot. Usually into the form of a mount for pendant lighting, or variations on shelving. For the most part, that shelf is totally fine. Except, the boards they sell you don't span over more than 3 stud widths. Their longest board is just a bit shy of 4 feet. Irritating to say the least, since most studs are 16" center-to-center - and there's no way I'd use these brackets in just plain drywall. I started out by locating the studs, and mounting the brackets. I mounted them 20" down from the ceiling, which is a decent height for the shelves, and keep things 'up and away' for the most part. 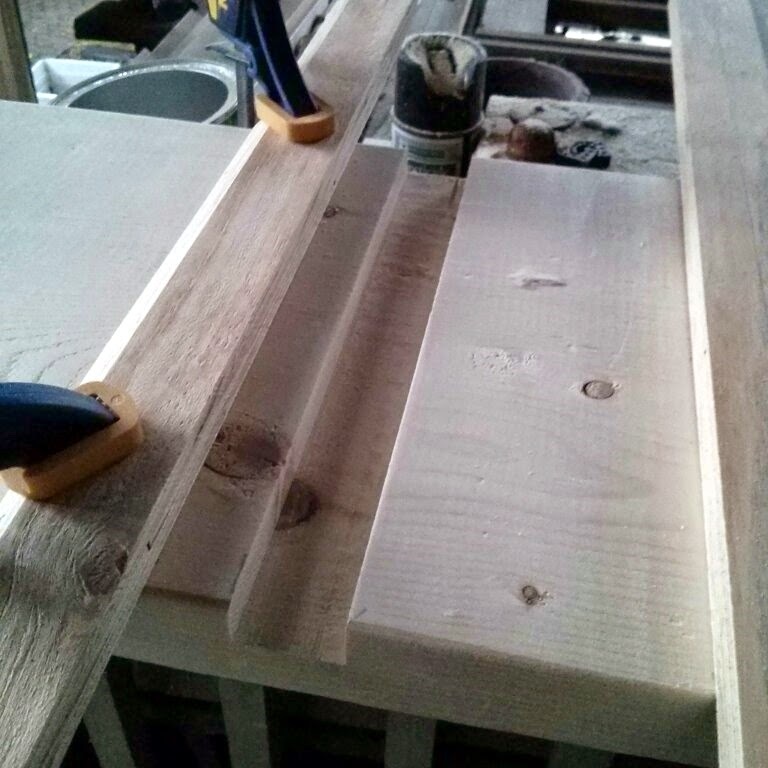 Once I had the brackets mounted, I placed the rough cut 2x12 on top (it was a bit over 8 feet in width - 98" overall or so), and I scribed where the bracket faces meet the shelf board on the bottom. 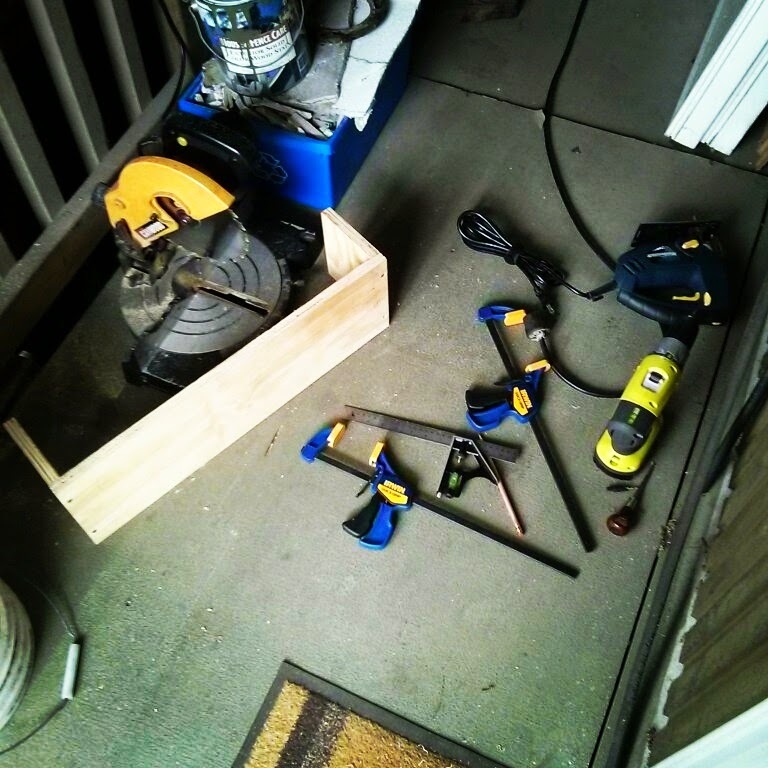 Next I set up a 'poor mans dado' jig, which is a circular saw and two boards/guides clamped on to the correct dado width. Passing the circular saw over in small bits to remove as much wood as possible, and then cleaning up the dado by hand later. After some rough chiseling and filing, the dados were looking pretty fair. They don't need to be perfect looking, they just need to be flat. Another task that is hard to see in this photo below, was notching out 3/8" out of the back of the dados, to get the shelf to fit around the brackets against the wall. At the back where the shelf almost meets the wall, is a slight gap, to allow extension cables to run behind it. Without the notch, the gap would have been close to 3/4", which was too much for my taste. And here's the finished result! The shelves hold a number of storage boxes (I could stack them 3 high, but that's a bit too tall) - the shelves can support a good amount of weight, and because I used 2x12 lumber, are plenty thick and shouldn't bow with the weight. I'm very happy with the way they turned out. I'm leaving them unfinished as I like the color of the raw wood, and they don't get much abuse so durability isn't an issue. AND they cost me less than the Ikea shelf boards would have cost to buy to cover the same span! In a previous post, I had built a corner shelf for my bathroom - because counter space is kind of limited. Turns out, my mother liked the way it looked and asked if I could build one for her. Since I had material left over from building the first shelf, I got to constructing another one - with some improvements. First I had to cut some 1" wide strips, for the shelf to attach to. I then cut the shelf with a jigsaw to try to match the angle of the wall. The bathroom wall is not square. In fact, the wall is roughly at a 92 degree angle. I wish I took pictures on how I managed to trace out that angle - because it was kind of creative problem-solving. I tuned an old hand-plane and took off some excess material from the board, it needed some tweaking, and I didn't feel like bringing out the belt sander, especially since I could get a good finish with the plane. Assembly is relatively easy. 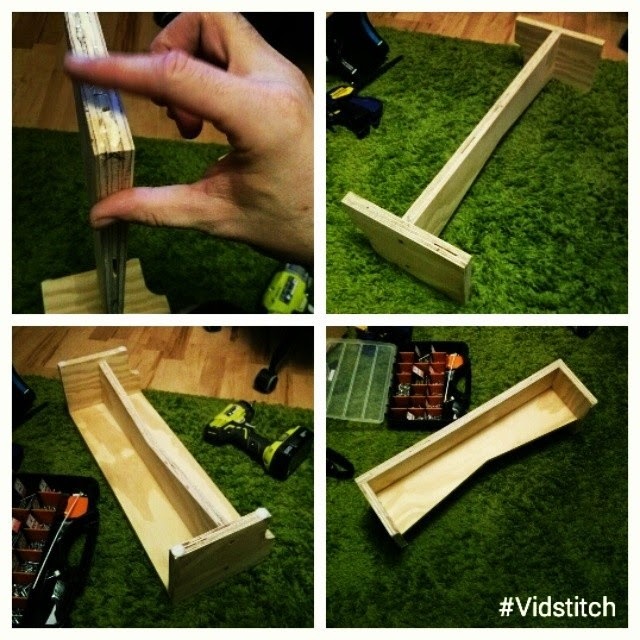 I put down the 1" strips of wood, and placed the corner shelf on top to check if it was level. It was 'close enough' - so I marked the bits that stuck out with a pencil, and marked underneath with a pencil where the strips should attach to the shelf. Now for the fun part - the power tools. I pre-drilled some pilot holes, mostly because I'm certain the wood would split if I just tried to sink screws in without them. My Ryobi countersink bit does okay, I lost the allen key to adjust the depth however. I used drywall screws because they were the right length and they were what I had on-hand. 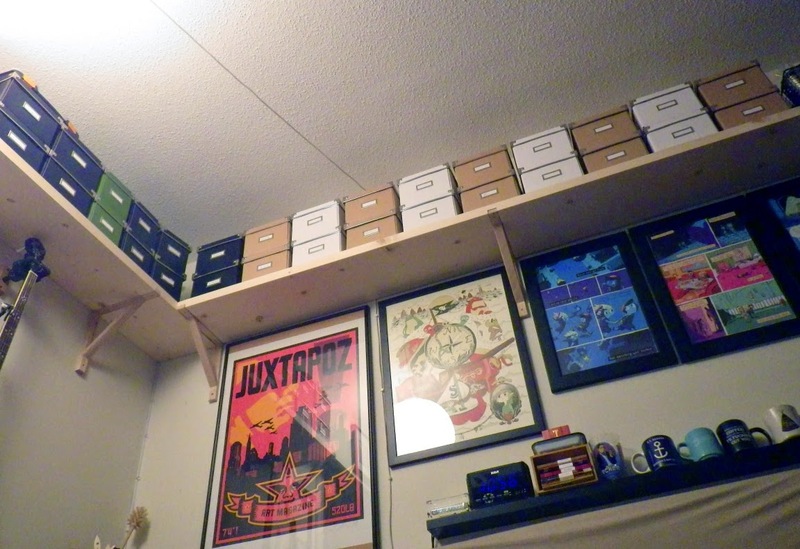 Plus, it's not like this shelf will bear a lot of weight, so they'll be more than sufficient. 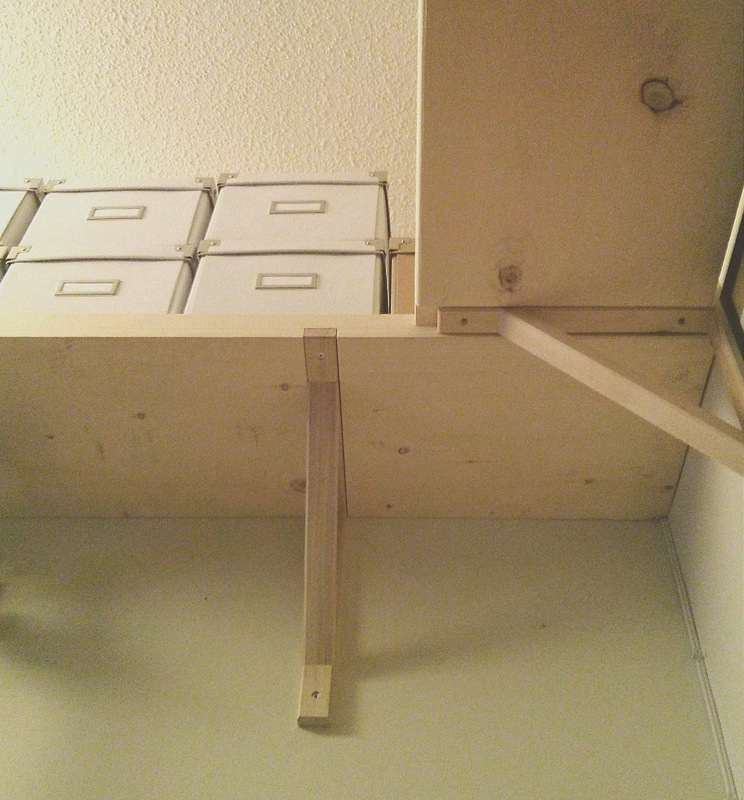 I also didn't glue the braces, because I wasn't in the mood to sand off the paint on the underside of the shelf. With the braces secured, I could trim off the excess. 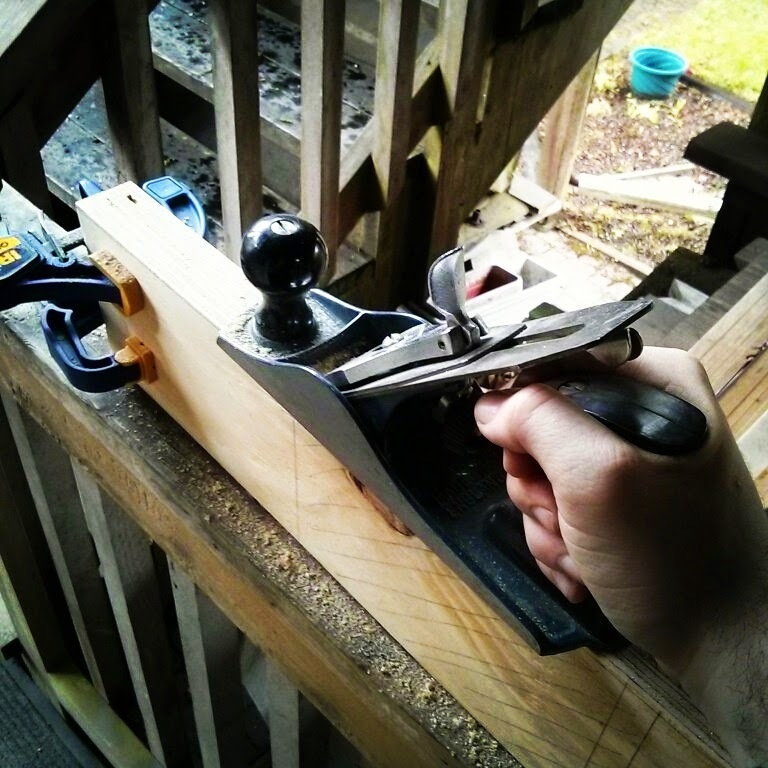 I opted to use my Japanese pull-saw, and I cut the braces off on an angle (a bevel?) - just to make it look a bit nicer than the previous shelf that I built. The screws that attach the shelf to the wall needed to be pre-drilled, and then sunk in part-way, to make the installation a little bit easier. Since the screws are underneath the shelf, it's not the most accessible - although an extension bit would take care of that. And voila, she's installed! But... not quite ready yet. The pale wood looks nice, but I know that this shelf will see a bit of unexpected moisture - so I figured some sort of finish would be in order. I still had some Minwax Wipe-on Poly from a previous project, so I figured that would make a fairly decent finish for the shelf. It didn't take long to apply, and after a few hours of drying, it looked nicer than before, really emphasizing the grain of the wood. It will amber a bit over time, but I'm okay with that. And with that, the shelf is finally done! The actual construction time took roughly 25 minutes, mostly because of hand-planing, and a healthy amount of time with the hand-sander, the finishing took a few minutes, and the drying time was about 4 hours. All in all, it was a quick little project, and hopefully I don't have to build another one of these any time soon! I don't know about you, but when I sit at my computer for extended periods of time, I'm always trying to find the most comfortable place for my feet to be. In the past I've tried a lot of different things, milk crates, stacked books, a plank of wood, garbage can, you name it. None of those things really worked out for resting my feet on. 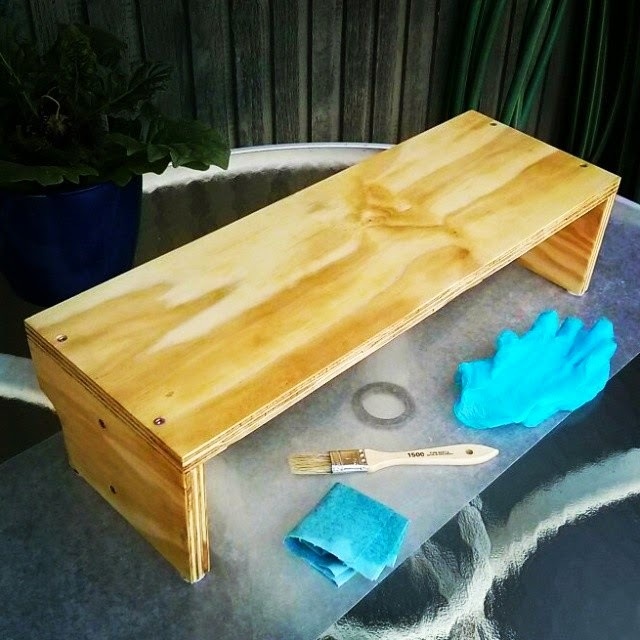 It was about time to build my own foot stool. It's technically a 'foot rest' or 'foot riser' if you want to get real picky about it, but either way - it's a place to put my feet when I'm at my desk. I started out with a single 24" x 24" x 3/4" piece of plywood from the 'place that sells improvement materials' - did some rudimentary measuring, and got to cutting. I did the cutting with my cordless circular saw, a miter saw, and a jigsaw, which isn't my ideal way to work but I didn't have access to a table saw, and my bandsaw motor is kaput. Planing plywood is not recommended. Tearout city. 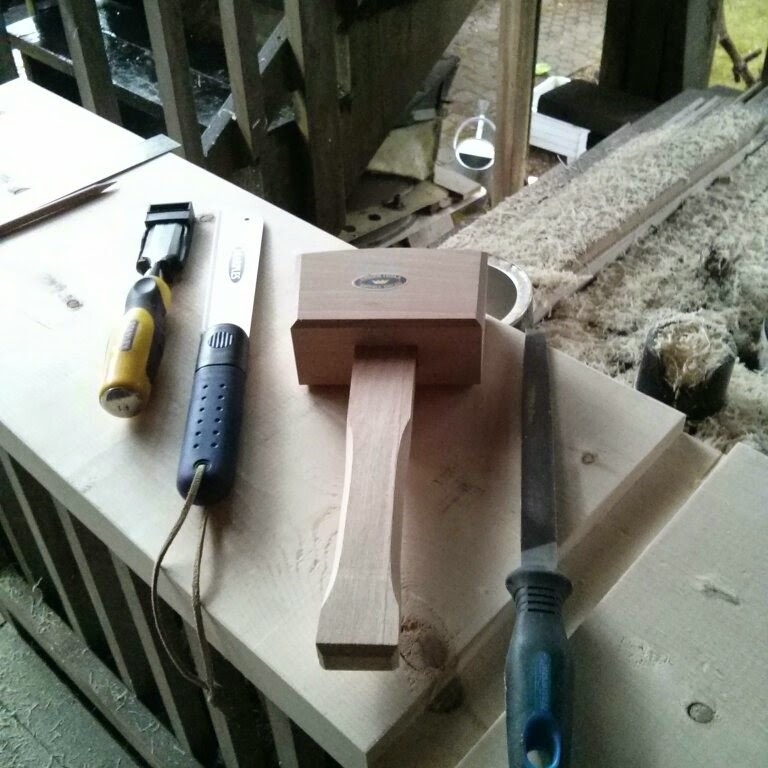 I ended up finishing the planing work with a couple files/rasps. And of course, a fair amount of swearing. My workspace was a tiny patio (as you can see in the photo below) which is usually where I do my work, because it's covered from the elements, and I can use the railing as a makeshift clamping surface. 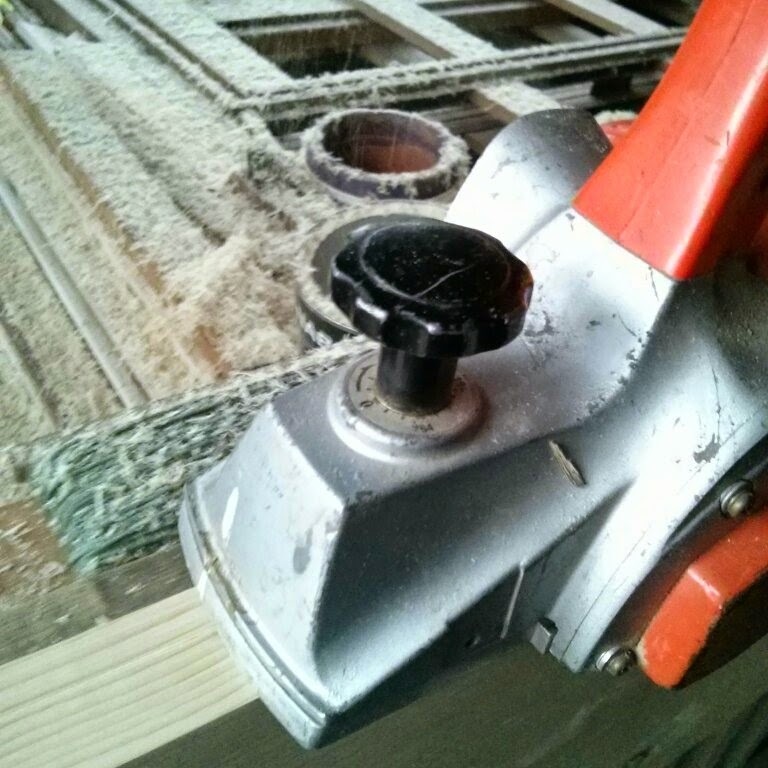 After cutting, measuring, test fitting, I realized I needed to trim a bit more material to clear the baseboards... so a quick visit with "Mr Jigsaw" and that problem was solved. Another thing I learned is that drilling into plywood "end grain" for lack of a better word, is also not ideal. Makes for kind of a poor join, but again, this is just a tiny stool to hold my feet 5" off the ground, so no big deal. For the cross-brace, I decided to do an angle cut into it, to make it look a little nicer, and just in case I needed to clear the base of my office chair. But mostly because it looked nice. And also to correct some poor cuts from earlier. After test fitting, adjusting, pre-drilling, and so on, it was time to do the glue-up. This part wasn't totally necessary - but it made the whole project just a little more secure and made it feel a bit sturdier. The last part of the whole build (if you can call it that) was to apply a finish to the thing. 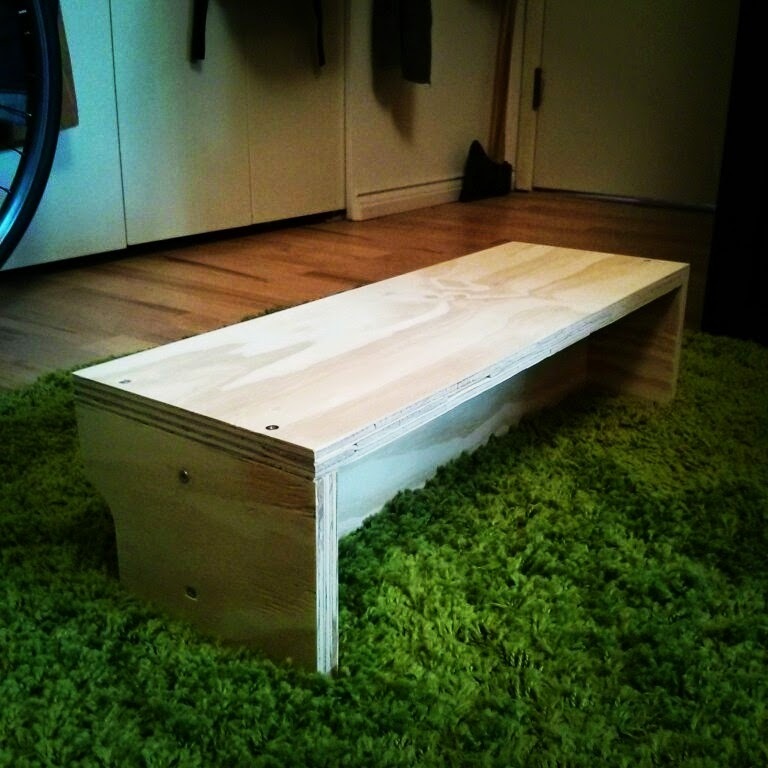 Cheap plywood is prone to splintering, and generally doesn't feel good. So I spent a fair amount of time sanding the whole project down, made sure it was relatively smooth, and then applied two coats of Minwax Wipe-On Poly. Normally you're just supposed to use a rag for wipe-on poly (I think?) but in this case I just used some cheap little brushes which worked out well. In retrospect, I should have poured off some poly into a small cup or container, because pouring it direct out of the rectangular bottle onto the work-piece was really annoying. Lesson learned for next time I suppose. This is what I consider a 'quickie' project because it was built on a whim, with no real planning or design beforehand, and it was purpose-built to suit a need. It's been under my desk for a few months now, and it's working very well.